Climate:	Sri Lanka is a round-the-year destination for the visitors who seek for sun and sea the best time to visit the island is from November to April. The Southwestern coastal area, where the most of the beach resorts are located. The central highlands are pleasantly cool and relatively dry from January to April. The peak season is mid December to mid January and March-April during Easter with a mini peak season in July and August when festivals and pageants are held through the country. Munneswaram Temple : This Temple in Chilaw is 50 miles north of Colombo and is one of the holiest Hindu Temples in Sri Lanka, coming down from the period before Ravana. Even King Ravana used to pay homage to this temple. The annual festival is held in July/August, where fire walking can also be witnessed. Then Visit Manawari Temple: Manavari is the first lingam installed and prayed to by Lord Rama and this lingam is also called Ramalinga Shivan. Dinner & Over Night Stay in Chilaw. Trincomalee : 165 miles from Colombo, is one of the largest and safest Natural Harbours in the World. Trincomalee is connected by Rail and Road. It has sunny weather throughout the year, with white sandy beaches, calm, placid and warm waters, ideal for underwater activities and for Whale watching. Nilaveli-10 miles away are the finest beach in Trincomalee starting at Uppuveli- 5 miles away extending all the way to Nilaveli. Pigeon Island is a great place for Diving, Snorkeling and sea bathing. There are 7 Hot Spring at Kanniyai just 5 miles away on the Anuradhapura road. Thiriyai Vata-da-ge is 30 miles to the North of Trincomalee and is one of the best monuments in Sri Lanka. Visit Koneswaram Temple (Shakteepitam) : Koneshwara Temple According to an inscription found on the doorway to the Fortress this Temple. Destroyed by the Portuguese in the 16 Century A.D. they threw all the columns down to the sea below. 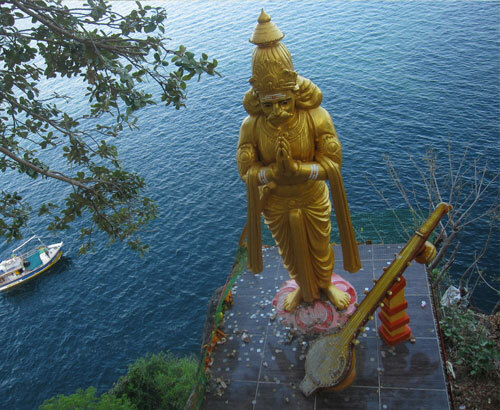 Three bronze statues were brought up by divers found among the columns in the sea and are now kept in the modern temple at the same site, within the Dutch Fort in Trincomalee. Dinner & Over Night Stay in Trincomalee. Sigiriya - Lion Rock is a “UNESCO World Heritage Site” and the 5th Century “Fortress in the Sky” which is perhaps the most fantastic single wonder of the Island. It is also known as Lion Rock because of the huge lion that used to stand at the entrance to the Palace on the summit of the 600-foot high rock. On its summit are the foundations of the Royal Palace, Water Tanks to supply water and all other buildings and at the edges the guardhouses. On one of the stairways the only known ancient work of Sinhala secular painting survived in the form of Frescoes of 21 life sized damsels still shining in their original colours. The Water Gardens, Fountain Garden, Summerhouses, Boulder Gardens and the Caves within the enclosed area should not be missed. KANDY – the hill capital is another “World Heritage Site”. It was the last stronghold of the Sinhalese Kings during the Portuguese, Dutch and British rule and finally ceded to the British in 1815 after an agreement. To the Buddhists of Sri Lanka and the World, Kandy is one of the most sacred sites as it is the home of the “Dalada Maligawa” - Temple of the Sacred Tooth Relic of Lord Buddha. Close by are the remains of the Royal Palace (“Maha Wasala”), “Palle Wasala”- where the Queens stayed-now used for the National Museum, “Meda Wasala” where other close relatives lived, Audience Hall, Natha Devala and Vishnu Devala are situated close by. The Bathing Pavilion (“Ulpenge”) is by the Lake and in the Center of the lake is the Island called “Kiri samudraya” (Milk white ocean) used by the kings as the summerhouse. Today it is the center of Buddhism, Arts, Crafts, Dancing, Music and Culture. Ramboda Falls : A gigantic water fall having three parts and very close to the 53km post along the above A-5 trunk road. The first part is above the road in the jungle (100m), second part is close to the road (3m) and the third part (100m)is below the road. Traveler should descends to the "Ramboda basin", where the famous "Ramboda Inn" situated from where he can see the whole fall. When we were there the upper part was covered with a fog and what you see in the picture was the third part. If look carefully, one can notice a bus on the bridge over the A-5 road at the top of the photo. Sri Baktha Hanuman Temple, Ramboda : On these hills of Ramboda where Hanuman was searching for Sitadevi, the Chinmaya mission of Sri Lanka built a temple with Hanuman as the presiding deity. On every full moon day special pooja”s are conducted and witnessed by thousands of devotees. Nuwara Eliya : The ‘Little England’ of Sri Lanka, is set against beautiful backdrops of Mountains, Valleys, Waterfalls and Tea Plantations. It is supposed to be one of the coolest places in the Island, but it is really just like an English spring day, although the temperature does drop at night. All around Nuwara Eliya you will see evidence of the British influence, houses like country cottages or Queen Ann style mansions. The Victoria Park, in the middle of the town, is a lovely place for a stroll or a picnic and is also good for Birding as you get some rare birds in this Park. Nuwara Eliya - Sita Amman Kovil : According to the Indian Epic Ramayanaya and the legends, the area where Sita, Queen of King Rama of Ayodhya in India, who was abducted by Ravana the King of Sri Lanka, was kept in hiding and the area she roamed is in the hill country of Sri Lanka. Four miles south east of Nuwara Eliya is another prominent peak, Hakgala. At its foot lie the Hakgala Botanical Gardens, and above it is the Hakgala Strict Nature Reserve. The gardens 55 acres in extent is smaller and less exotic than the Peradeniya Royal Botanical Gardens, but at 5,600 feet (1,707 meters) elevation the species of flora are quite different. Opened as an experimental Cinchona plantation for the production of the malaria antidote quinine in 1860, the pride of the gardens is now roses and tree ferns. Kelaniya Raja Maha Temple : One of the earliest Buddhist Dagobas traditionally believed to be the site visited by the Buddha 2500 years ago. According to the Mahavamsa, the “paddy-heap” shaped dagoba at Kelaniya marks the spot where the Buddha, on the request of a Naga king Maniakkika, sat on a ”gem-studded throne” to preach the Dharma to his subjects and convert them. It is recorded that King Yatala Tissa of the 3rd Century B.C. had constructed the Temple and the Dagoba may dates to an earlier period. An annual Perahera called “Duruthu Perahera” is held each year during the month of January for 3 days. Colombo : is the business and commercial center and the new capital is Sri Jayawardhanapura Kotte, only a few miles away. Colombo was only a small seaport, which came into prominence in the 16th Century with the arrival of the Portuguese in 1505 and the development of it as a major Harbour took place during the British period. Colombo became the capital of Sri Lanka in 1815 after Kandyan Kingdom was ceded to the British. The remains of the buildings during the period of the Portuguese, Dutch and British rule are found in every area of the city. None of the Portuguese & Dutch fortifications are found today but some of their buildings and churches could be seen in the Fort & Pettah areas. Visit Fort, the former British administrative center and military garrison, Sea Street - the Goldsmith’s quarters in the heart of Pettah, the Bazaar area where there is also a Hindu Temple with elaborate stone carvings, the Kayman’s Gate with the Belfry at the original gate to enter the Fort. - 05 breakfast & 05 dinners. - Transport in an A/C Car / Micro van / Mini Coach / Coach with the service of an English-speaking chauffeur / National Guide. - Sightseeing as mentioned above. - Entrance Fees to Sigiriya Rock, Kandy Tooth Relic Temple & Hakgala Botanical Garden. - Meeting and Assistance at the airport. - Any entrance fees not mentioned above. - Camera & video permit. - Any expenses of a personal nature. - Any other expenses not mentioned above.